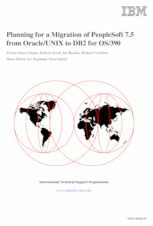 This IBM Redbooks publication discusses the process to migrate PeopleSoft Applications 7.5 on Oracle on UNIX to PeopleSoft Applications 7.5 on OS/390 with DB2. We migrated the PeopleSoft Tools and the Human Resources (HR) Application. The book is intended to help you plan the migration process. The information is based on installation experiences gained at the ITSO in Poughkeepsie and with customers who have completed this process. This book will be especially useful for those who are migrating to PeopleSoft Applications on OS/390 for the first time.